You may think of a quesadilla as cheese melted between two pre-cooked flour tortillas—an acceptable way to make this authentic Mexican antojito (snack). 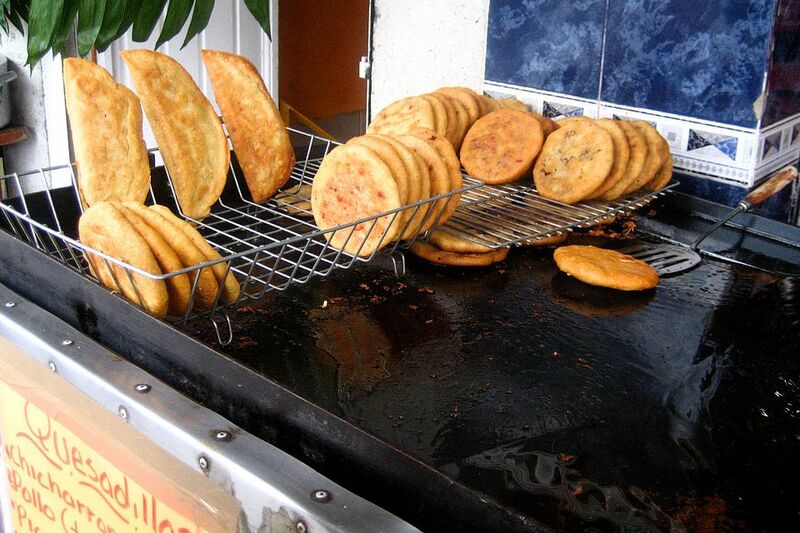 Another style, commonly sold as street food in Mexico, starts with an uncooked corn tortilla filled with cheese and/or other ingredients. These get fried to order until the tortilla turns golden brown, giving it a crunchy corn-chip texture and flavor that pairs deliciously with the melted cheese. In Mexico, residents of the capital city generally maintain that you can fill a quesadilla with almost anything and even omit the cheese. People from other parts of the country argue that a quesadilla without cheese cannot be called a quesadilla, given that the name itself comes from queso (cheese). Divide the masa into 10 evenly sized balls. Roll each ball between two pieces of plastic wrap or waxed paper to form a disk about 4 inches across (or use a tortilla press, if you have one). Cut cheese into 10 slices and place one in the center of each tortilla; add a small spoonful of additional filling, if you like. Fold the tortilla in half and press the edges with dampened fingers to seal it. Fry the quesadillas in batches in about 1 inch of hot oil or lard (or deep fry, if you prefer), turning once or twice, until the masa turns golden brown on both sides and gets slightly crispy. Drain the fried quesadillas on a rack or several layers of absorbent paper before serving. Tips for Eating: Wrap quesadillas in a piece of absorbent paper and eat them out of hand. Break the fried quesadilla down the middle to make two halves, or lay the quesadilla on its side and gently break it open longitudinally at the top; dab sauce to taste over the exposed filling. Caution: The filling will be very hot.